1. Cook McCain Superfries Steak Cut as per packet instructions. 2. Place 1 tbs of oil in a large fry pan and heat over a medium heat. Add the eggs and allow to fry until whites are hard and yolk is still runny. 3. Meanwhile, place 1/2tbs of oil in another large fry pan and heat over a medium heat. Add diced bacon and allow to cook until golden brown and starting to crisp. 4. 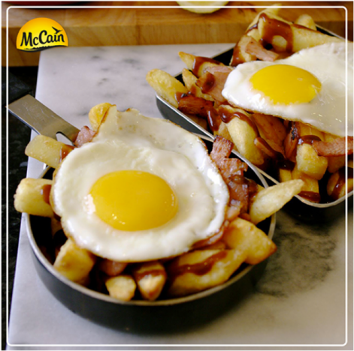 Remove McCain Superfries Steak Cut from the oven and divide amongst four serving plates. Top with BBQ sauce, bacon and 1 egg per serve. Sprinkle with chopped chives and serve with lemon cheeks. 1 Cook McCain Superfries Steak Cut as per packet instructions. 2 Place 1 tbs of oil in a large fry pan and heat over a medium heat. Add the eggs and allow to fry until whites are hard and yolk is still runny. 3 Meanwhile, place 1/2tbs of oil in another large fry pan and heat over a medium heat. Add diced bacon and allow to cook until golden brown and starting to crisp. 4 Remove McCain Superfries Steak Cut from the oven and divide amongst four serving plates. Top with BBQ sauce, bacon and 1 egg per serve. Sprinkle with chopped chives and serve with lemon cheeks.